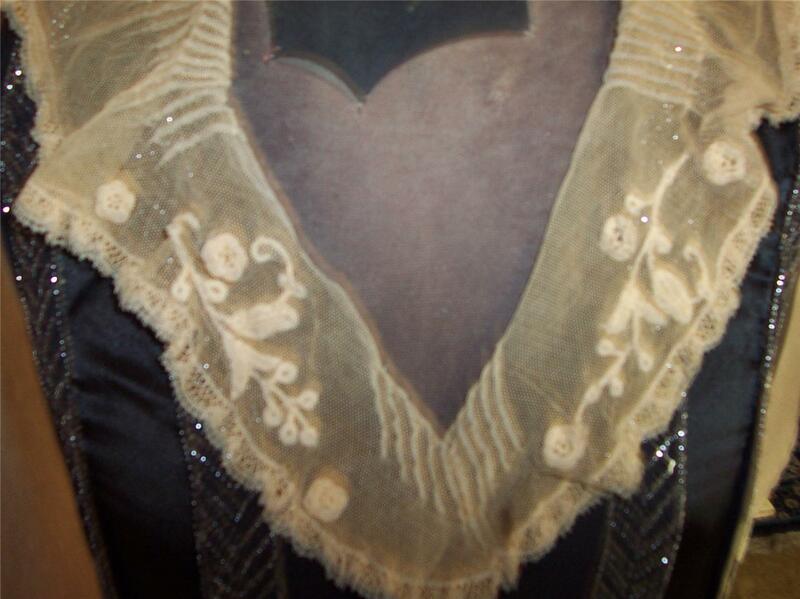 This gorgeous hand-made dress from the Turn-of-the-Century is gorgeous! This dress has a beautiful black material paneled with black satin. Between the layers of material there are one inch bands of copper beaded trim. The beads are all stitched to the trim. This dress just dazzles! The beautiful and delicate ecru lace collar is detachable and there are snaps around the collar where it can be snapped on or off for hand-washing seperate from the dress. The dress is sleeveless and is a head-turner with all the beadwork. On the left side there is an opening for ease in gliding this beauty on -- there are a total of 11 hook-and-eye enclosures and 3 snaps. (The 5th picture shows the side-opening and hooks). Also, at the shoulder on the left side is an opening with 5 hook-and-eye enclosures to aid in getting the dress on. 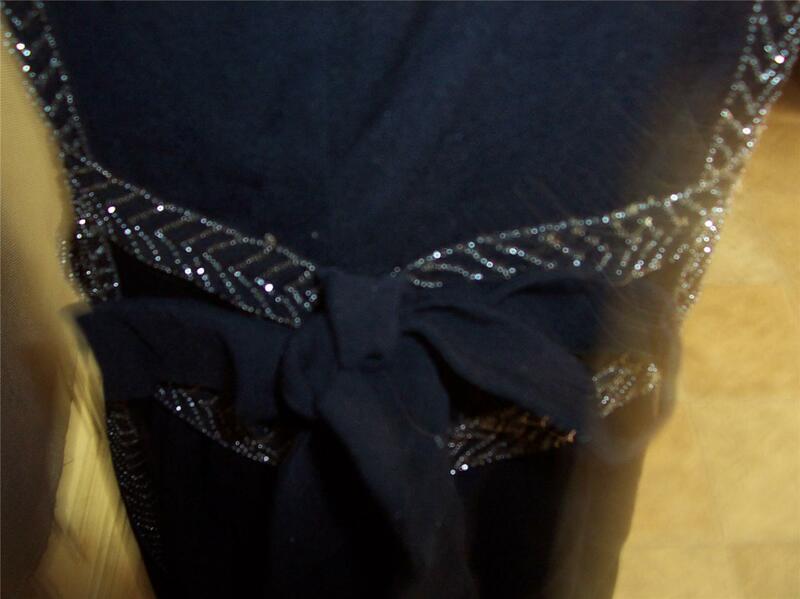 There are two 42 inch long sashes at the waist area (on each side) of this dress that are to be tied into a bow and the tails of the sashes flow down the sides of the dress. The elaborate beadwork flows vertically down the dress on all sides and horizontally at the waist and hem area. (see photos). The beadwork is in remarkable condition and appears to be intact. The dress falls just above the ankle area depending on the heighth of the wearer. What an incredible piece of history! *There are about 3 tiny (moth ?) holes in the fabric, but it is difficult to see them unless looking for them due to the double layering of fabric. Other than that, this dress is in incredible condtion for its age of over 110+ years! 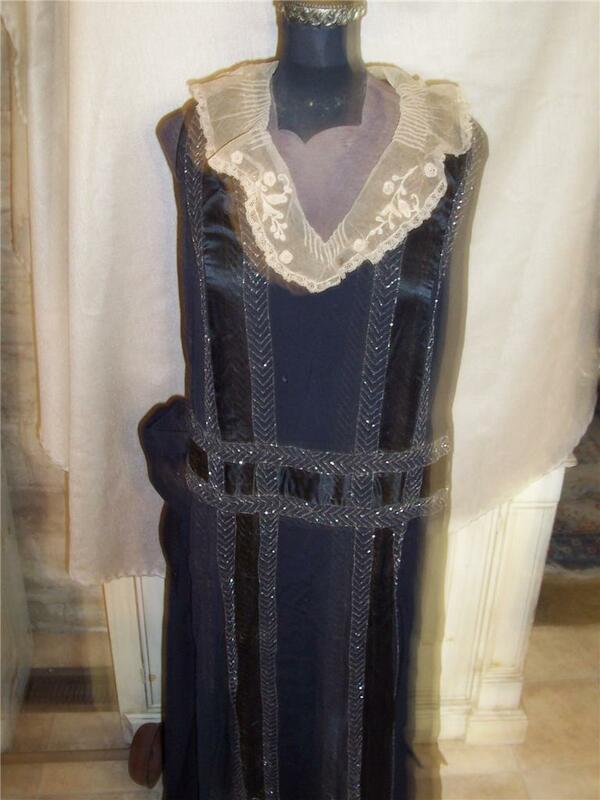 This fabulous ANTIQUE 1900'S DRESS is so stunning! 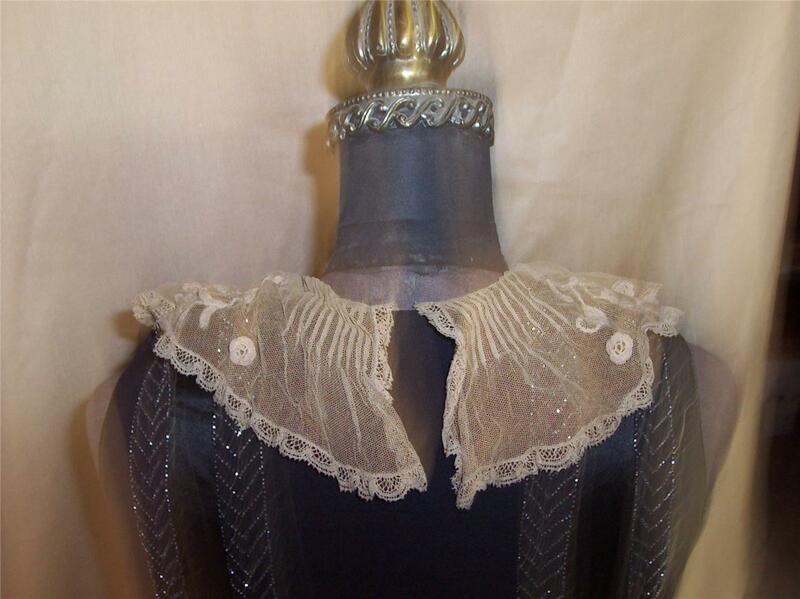 What a nostalgic piece of the past to add to your vintage clothing collection or to wear to a party! Despite the blurry photos, I think this dress is most likely Post WWI or around 1919, give or take a couple of years. It might even be later but the V neck with the lace looks a bit early to me.